We’ve seen these Bengal kitties, Ukee & Koru, before. They live in one of the most cat-friendly houses ever! Here’s Koru showing how to put such a fab house to good purpose. I love all the simple, sisal covered posts around for the kitties. Want to make a sisal post yourself? Check out this tutorial for a DIY sisal scratching post. Just make it longer and leave the base off. 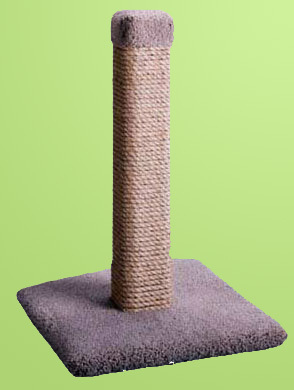 This Mighty Cat Tower is unusual in that it wraps around a corner with an unusual footprint to make it less obtrusive. What a great idea! You probably should anchor it to the wall, but if the base is heavy enough maybe it wouldn’t need it. Important Note: the author of on of the Cat Tree tutorial recommends using 3/8″ Brazilian sisal rope because it’s stronger, but more importantly because it’s less heavily oiled than other sisal rope.